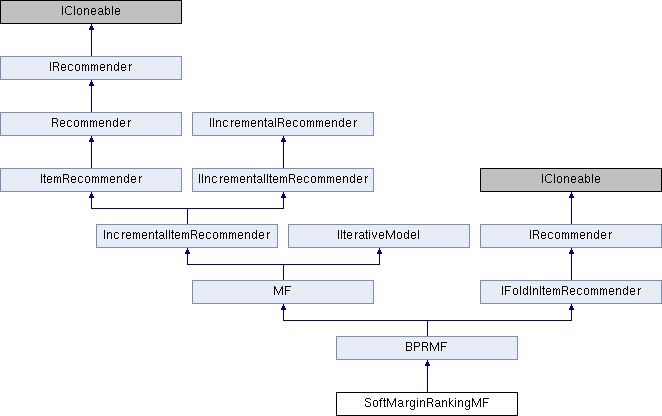 Matrix factorization model for item prediction optimized for a soft margin (hinge) ranking loss, using stochastic gradient descent (as in BPR-MF). Markus Weimer, Alexandros Karatzoglou, Alex Smola: Improving Maximum Margin Matrix Factorization. Machine Learning Journal 2008. This recommender supports incremental updates. Reimplemented in ExternalItemRecommender, ExternalRatingPredictor, BiPolarSlopeOne, SlopeOne, Constant, GlobalAverage, UserAverage, ItemAverage, and Random. Iterate over the training data, uniformly sample from user-item pairs without replacement. Iterate over the training data, uniformly sample from users without replacement. Iterate over the training data, uniformly sample from user-item pairs with replacement. Iterate over the training data, uniformly sample from users with replacement.